The Tarsier Sanctuary is a large forest dedicated to the protection of tarsiers, small nocturnal primates with big, round eyes that feed primarily on insects. 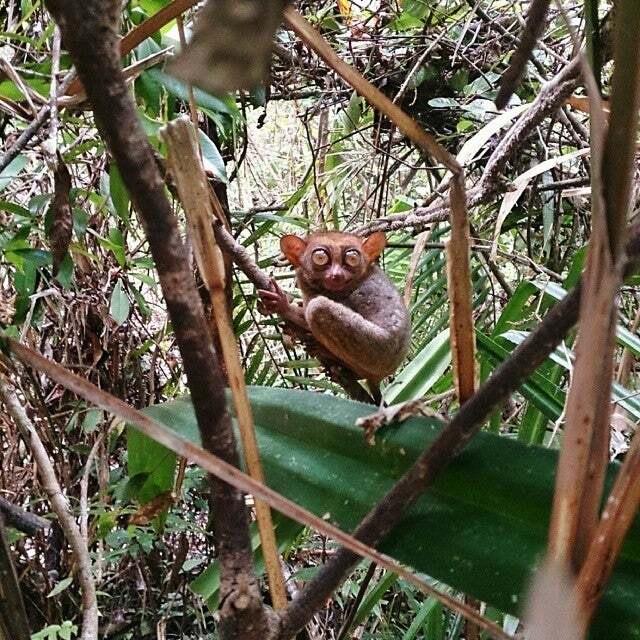 Why Philippine Tarsier Sanctuary is special ? 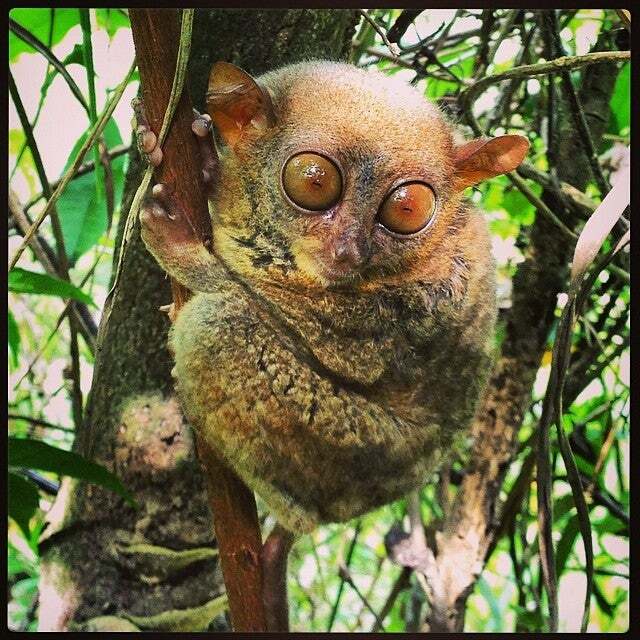 Philippine Tarsier and Wildlife Sanctuary was built to protect the endangered tarsier, the world’s smallest primates. The tarsier sanctuary is located exactly 4 kilometers from the town centre of Corella and a mere 20 minutes drive from Tagbilaran City. The Corella Philippine Tarsier Sanctuary is maintained by a non-profit organization called Philippine Tarsier Foundation. Visitors as well as researchers can learn about this 45 million year old species of small primates that can amazingly turn their heads to 180 degrees. It provides immense knowledge about this endangered specie and also a great opportunity to see one of the rare species in the world. What to explore at Philippine Tarsier Sanctuary? A visit to the sanctuary is just like a trip inside the deep forest having thick vegetation with different flora and fauna. Inside the sanctuary, travelers can see tarsiers that can freely live on its natural habitat. The tarsiers are kept in such manner so that they are free to travel inside the mini protected forest and roam inside the larger area of the sanctuary. Visitors have to enter the semi enclosed area composed of shrubs and mini forest where they can spot and take photos of the tiny tarsiers. Inside this sanctuary, tarsiers are found resting up in trees, behind leaves or in branches, jumping from one tree to another when disturbed. How to get to Philippine Tarsier Sanctuary? In Tagbilaran take a tricycle, a motorbike, a jeepney or a bus and go to Island City Mall. Bus terminal located just in front of Island City Mall. Take a bus they goes to Sikatuna. The last stop of the bus is Loboc. And ask a driver to stop at Tarsier Sanctuary. Then you need to walk a few minutes to the Tarsier Sanctuary entrance. The road takes you 20 minutes and costs 17-50 pesos depending on a type of a public transport. It is quite hard to spot a Tarsier in the wild as it is a shy nocturnal animal and sleeps at daytime near the trunks of trees and shrubs deep in the bushes and forests. As you will be walking in the wild, expect uneven surfaces (there are some steps to climb) and insects, mosquitoes (insect repellant is recommended). The staff can also assist to take pictures of you with the Tarsiers so just ask nicely – of course, the camera angle should be reasonable since most of the Tarsiers are resting quite high up in the trees. You can take pictures of the Tarsiers but no flash photography is allowed as camera flashes will scare these creatures. Also visitors are not allowed to clap or make loud noises to get the Tarsier’s attention. You can get your own “Tarsiers” in the form of souvenirs e.g. magnets, key chains at reasonable prices at the sanctuary gift shops. There is a wide selection so you will be spoilt for choices! You are not allowed to touch the tarsiers as they tend to commit suicide while in captivity as they will feel very nervous and stressed. You need to pay first and wait your tour guide at the Visitor. Briefing will be provided to the guest prior to the tour inside the sanctuary.